Who doesn’t like smoked ribs, beef brisket, pulled pork, and all those other delicious meats that can only come from a smoker? But as delicious as the food may be, not everyone has the patience and the time to actually smoke food. You have to light the charcoal and make sure that your fuel supply will last for the entire cooking period. There’s also some babysitting involved as well as some cleanup after all that work. Electric smokers are perfect for the ‘set it and forget it’ kind of people. They regulate and monitor temperatures during prolonged meat-smoking sessions, eliminating all the hassle. If you aren’t sure you’re up to the task of using a charcoal or gas smoker, then an electric smoker may just be what you need. Of course, to really get the best-tasting results, you need to get the right electric smoker. Lucky for you, we’ve got just the list – the best electric smokers in the market today. The crown jewel here is Masterbuilt’s portable electric smoker. Its selling point is its fantastic price which is better than any other on this list. It is also the smallest and most compact smoker. Weighing a paltry 21.6 pounds, it is perfect for that adventure on the road. If you need to smoke enough meat for a get together, then the 30″ digital electric smoker by Masterbuilt is perfect. It has an easy-to-use system and smokes meat like a commercial smoker. Char-Broil’s Deluxe smoker is easy on the eyes and strikes just the right note. It flaunts top-notch construction and insulation thanks to its double wall. It has a stainless steel two-tone finish and a glass door. While it costs a little more than its counterparts, it is worth it. 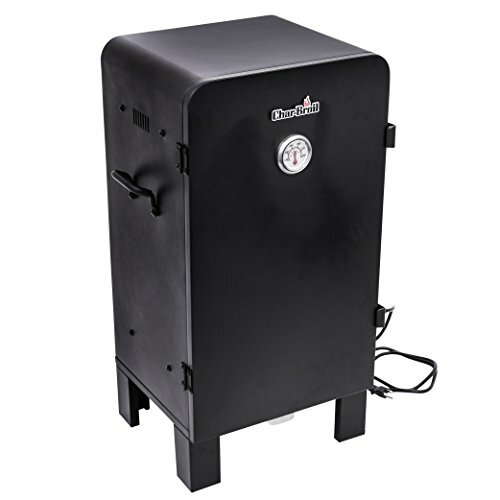 The Smoke Hollow 30162EW has the lowest price amongst the 30-inch smokers. You will love its glass door and 1500-watt heating element with a temperature control feature. Dyna-Glo’s 30-inch beauty has a digital thermostat and a meat thermometer. Use its digital push button controls to set your preferred cooking time and temperature. 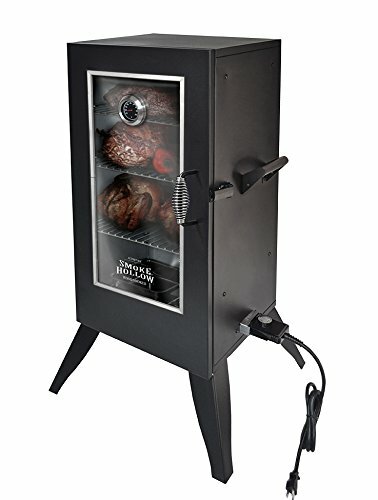 Is an electric smoker any good? What are the benefits of going electric? 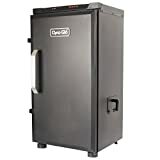 BUY NOW 19.4 x 19 x 32.5 inches GHP Group, Inc.
Smokin-It Model #1 Electric Smoker $329.99 BUY NOW 12.5 x 17.25 x 13.5 inches Smokin-It LLC. Best electric smoker for the money: If you’re looking for an electric smoker, then there’s none better than the Masterbuilt 30-inch Black Digital Electric Smoker. This electric smoker features an energy efficient design due to its walls being 100% insulated. Not only that, the smoker is also able to maintain the temperature consistently. Inside the smoker, you get 730 square inches of cooking space separated by 4 chrome-coated racks so you can cook different foods simultaneously. The digital temperature and timer controls makes it easy to operate the smoker. 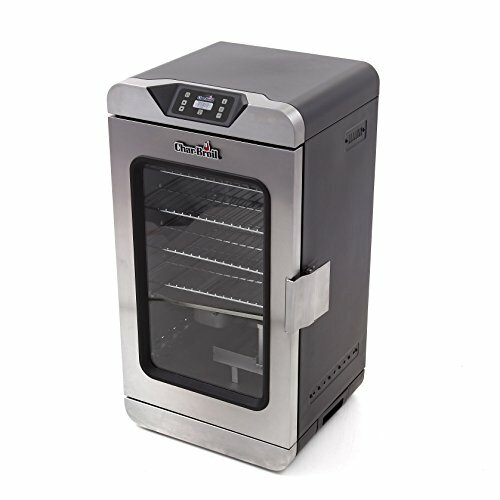 Even better, the timer can run for as long as 24 hours and the smoker comes with an automatic shut-off feature which makes it truly perfect for people who love “setting it and forgetting it.” There’s also a stainless steel damper that allows you to control the amount of smoke inside the machine. Plus, there’s a wood chip loading system at the side that makes it convenient to add your favorite smoky flavors. However, it doesn’t come with a meat probe. And the digital display can be a bit difficult to read in the daylight. Plus, it doesn’t come with wheels which makes it a bit inconvenient to move the smoker in and out of the house. Best electric smoker for turkey: If you want a powerful electric smoker, then you don’t have to go farther than the Char-Broil Electric Vertical Smoker. It features a 1,500 watt variable temperature heating element. Within the smoking chamber, you’ll find 3 adjustable cast iron cooking grates that provide a total of 504 square inches of cooking surface. The double-walled construction of the smoker ensures that it holds the temperature consistently. Other features include a wood chip and water pan, a chrome-plated handle, and a lid-mounted temperature gauge with bezel. However, the bottom corner of the door doesn’t always close all the way so you’ll need to make sure it’s sealed shut. Not a big drawback but a little inconvenient. Also, it takes quite a while to heat up. Plus, it doesn’t produce much smoke at low temperatures because the heating element turns off to maintain the temperature. 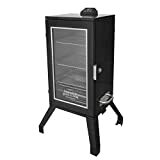 Best electric smoker for fish: Unlike our previous other picks, the Smoke Hollow 3016DEW 30-Inch Digital Electric Smoker comes with a view. A window where you can visibly check on your meats without opening the door. Ain’t life grand? In addition to that major convenience, this smoker comes with digital electronic controls, an LED display, and an external loading wood chip tray. 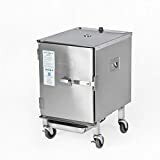 Also, the smoker features a large capacity – 2 cubic feet – as well as 3 chrome-plated cooking grids that are height adjustable which means that you can easily fit in meats of different sizes. However, there have been instances when moisture gets into the control panel from within the cooking chamber which can affect the electronics of the smoker. You’ll need to replace the rubber gasket at the bottom of the controller with something like food grade silicone too keep it sealed. Also, the wood chip tray could be bigger; it only fits enough wood chips to produce smoke for about an hour or so which means you’ll need to keep feeding it if you plan on doing some low and slow cooking. Best electric smoker for brisket: The Smokin-It Model #1 Electric Smoker is one of the most portable electric smokers we’ve ever seen. And it all has to do with its 3-inch diameter rubber casters and side handles that allow you to push this baby around whenever you need it. And it comes with a 12-foot power cord. The smoker also features 3 removable shelves (though it has space to fit 4), a 400-watt heating element, and a load capacity of 22 lbs. The entire smoker is constructed of 18 gauge stainless steel and NSF certified for restaurant use. It also features fiberglass insulation to help reduce heat loss. The drip pan slides under the smoker for easy cleanup. However, the cooking space isn’t as big as other models. And this smoker is a bit pricey. 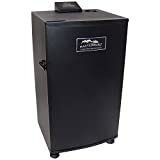 Best electric smoker for jerky: The Char-Broil Analog Electric Smoker is one of the best in the market because it features double-wall insulated construction to keep heat in and dual exhaust ports to help control temperature. The dual latches on the door help create that perfect seal while a door-mounted temperature gauge enables you to easily monitor the temperature inside. Three chrome-plated cooking grates provide you with 544 square inches of cooking space. And the drip tray (underneath the smoker), water tray, and wood chip tray are all easily accessible from the front. However, you only get about an hour of smoke if you fill up the wood chip tray. And while the product does look durable, it can easily get dented during shipping. In addition, it doesn’t come with wheels. Yes, it does have carrying handles on the sides but wheels are more convenient if you want to bring this baby out from the garage to the backyard and store it away again afterwards. 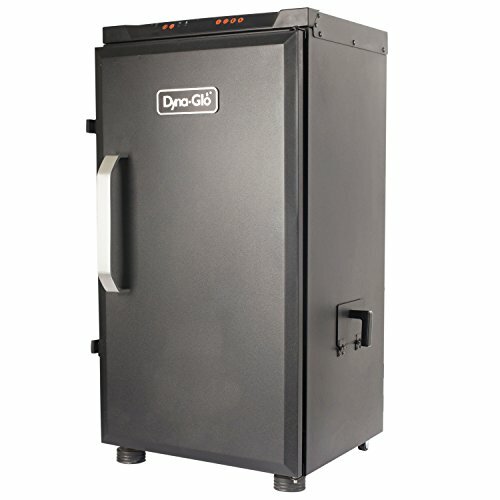 Best electric smoker for beginners: This 30″ Digital Electric Smoker from Dyna-Glo looks like a small vault or fridge from the 1900s. But don’t let its “old look” fool you because this is quite compatible with people from the digital age. The control panel located just above the door of the smoker features push-button controls as well as an LED display that allows you to easily set and monitor both cooking time and temperature. There’s an integrated meat thermometer that helps you keep an eye on how you’re meat’s cooking. We love the convenience of the side access wood chip loader which prevents you from opening the door and losing heat as well as smoke. The firebox itself is double-walled and insulated, featuring a high-temperature door seal to keep heat and smoke inside the chamber. Plus, you get a total of 732 square inches of cooking space with the included 4 chrome-plated cooking grates. One problem with this smoker is the fact that the wood chip tray is quite small which means you’ll need to reload it a bit more frequently than we’d like. Also, we noticed that the door doesn’t seal quite as well as other models as we’ve noticed leaks in places. 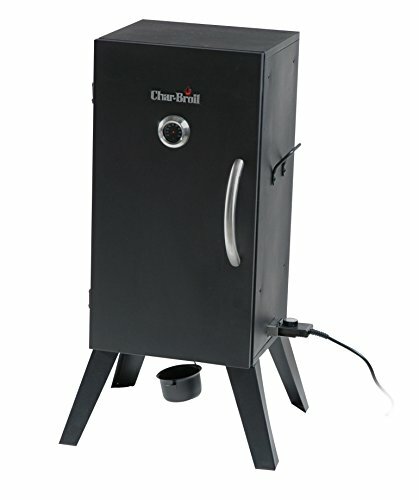 But for a beginner smoker, this one is very convenient and easy to use at a very affordable price. The Portable Electric Smoker by Masterbuilt is perfect for smoking at home or on-the-go. There's room to smoke a whole a turkey or ham, slabs of ribs, or your favorite BBQ for tailgating. This portable smoker is ideal for camping or road trips. 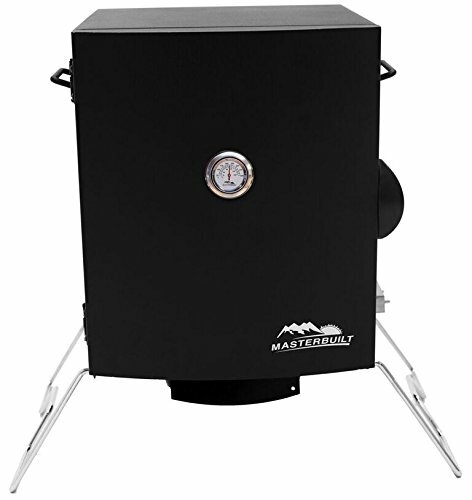 Masterbuilt has made smoking simple. And portable! The Char-Broil Digital Electric Smoker Deluxe is the perfect smoker for the smoker enthusiast with the space to cook for large groups. Char-Broil Digital Electric Smoker gives the outdoor chef complete control over their smoked food via fire access doors, air dampers and 4 smoking racks smoker has a whopping 725 sq. in. of cooking space over three different cooking grates - that's more than enough space to cook for a party of 8 or more! The insulated double wall construction makes this smoker truly the finest. 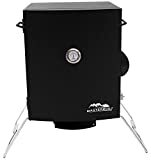 The hassle free construction makes the Char-Broil electric smoker 10 times more efficient with the wood chips - meaning you can fill the box once compared to 10 times with the leading electric smoker and still get the same amount of smoke. Also, this smoker makes smoking your favorite foods error free by turning off automatically when the food is done cooking. The warming feature keeps the food warm inside the smoker until it is removed and ready to be served. The locking latching with a smoke tight seal ensures the flavor and smoke stays inside (try Char-Broil's flavored wood chips for a tasty treat) and indirectly cook your meal to a juicy, Smokey and tender perfection. Using the removable temperature gauge, you can easily control the heat you cook at by monitoring it on the advanced control panel with easy-read, blue LED display. The Char-Broil Digital Electric Smoker features wheels and an integrated handle for easy mobility. 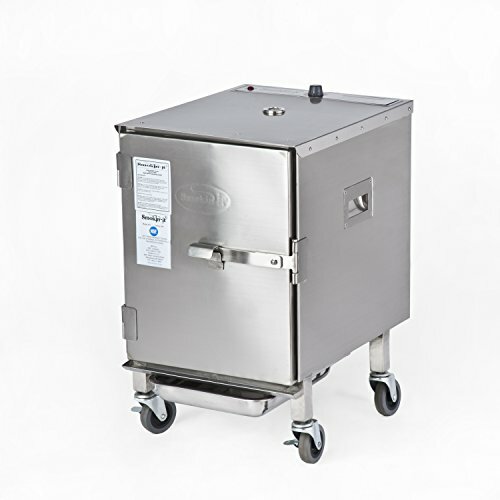 A high capacity grease tray is located underneath the smoker for easy grease removal and clean up. Measures 18.1 W x 16.5 D x 32.5 H.
The Smoke Hollow 30 in. Electric smoker is great for smoker-style cooking, while never having to worry about running out of LP gas. The double wall construction, keeps the heat generated by the 1, 500W element on the inside where you want it. This electric unit operates much like your electric oven inside the home, so just add your favorite wood chips for real smoke BBQ flavor. So, you want to buy an electric smoker. Well, we gotta tell you, it isn’t going to be easy. When it comes to choosing the right outdoor cooking equipment, it really never is. But it does pay to be really cautious about your choice because, if you aren’t, you’ll be eating the results of your poor choice for the next several months. And who wants that? Of course, just like when choosing a grill, there are a lot of things you must consider to find the right electric smoker for you. We’ve constructed this short but very informative guide to help you sort through the numerous options before you. If you’ve been researching about smokers, then you already know that there is this ongoing debate between traditional smokers (i.e. gas, charcoal, pellets) and electric smokers. Some grill experts will tell you that nothing will taste as delicious as smoked meat cooked the traditional way. Those who love electric smokers argue that smoking meat on these also produce delicious food. Now, as you well know, taste is rather subjective. And in our humble opinion, both electric smokers and other types of smokers enable you to create truly orgasmic food. Whether one is better than the other is a matter of opinion. The question you need to ask yourself is this – do I want an electric smoker or something more traditional? Easy to maintain. Compared to charcoal and gas smokers, an electric smoker is much easier to maintain. You don’t have to clean out any ashes or worry about running out of fuel while it cooks. Safer. Compared to all other types of smokers, an electric smoker comes with very few risks. Leaving it on for several hours doesn’t pose the same risk as that of charcoal or gas smokers. Beginner-friendly. Electric smokers, as we’ve already mentioned, are very easy to use and doesn’t require much expertise. You can easily set it and forget it which makes an electric smoker the ideal choice for those who are new to smoking. Cleaner energy. Compared to charcoal and gas, electricity is a cleaner form of energy which means your food is also not subjected to many contaminants. Capacity: The right electric smoker should be able to cook enough food for you and whomever you plan to feed. A lot of electric smokers offer around 500 to 700 square inches of cooking space which should be enough to feed a big group. For bigger groups, you’ll need to get a capacity of 700 to 1000 square inches. Portability: If you want to travel with your smoker or just have an easier time to move it around your backyard, you’ll need to consider how much the smoker weighs. A lot of electric smokers are made of lightweight materials such as aluminum. You may also want to get a unit that features wheels and/or carry handles. Material: A smoker needs to be durable and able to handle heat very well. Stainless steel is commonly used in constructing electric smokers because they are easy to maintain, very tough, and able to hold the temperature steady. Controls: Electric smokers can be analog or digital. Analog electric smokers feature a knob that allows you to set the temperature by turning it, much like you’d do with a regular oven. Digital smokers feature a control panel that allows you to input the temp you want to reach and an LED display. Some even come with a timer. Temperature range: The temperature range of an electric smoker lets you know exactly what type of food you can cook in it. Cheese and other small items require the temperature to be as low as 100°F. If you want to smoke really large turkeys, you’ll need an electric smoker than can reach up to 275°F. Racks: Electric smokers typically come with 3 to 4 racks that hold your food. The number of racks will normally depend on the size of the smoker. Some smokers come with height adjustable racks, enabling you to configure the firebox to fit your different meats. Chip loader: To give your food that smokey flavor, you’ll need to put wood chips into your electric smoker. Some electric smokers feature a wood chip tray that requires you to open the door and refill the tray. Some smokers feature a side-loading wood chip tray which means you don’t need to open the door to reload the tray. It reduces heat and smoke loss. Window: To make sure your food is not getting overcooked, it’s natural that you open the door of the smoker from time to time. Unfortunately, doing so causes heat loss which causes your temperature to fluctuate. In addition, it also causes smoke to leak out which lessens the flavor. This is why some manufacturers now offer models that feature a window, enabling you to check your food without opening the door. An electric smoker, just like any outdoor cooking equipment, is an investment. Still, price is a consideration for any buyer. Electric smokers range from $80 to $500, with most models priced around $250. While it’s tempting to go for the cheapest model available, such a model doesn’t guarantee that the quality of the build will be up to par or that there won’t be any leaks that cause the temperature to fluctuate. High-end models, on the other hand, may have a lot of nice-to-have features but if it’s outside your budget, we don’t recommend that you spend a lot on your electric smoker unless you have money to spare. In general, a mid-range model should be sufficient enough to meet most cooks’ needs.